Almost every filmmaker in the history of cinema would be thrilled by the knowledge that a feature of his (or hers) is considered an undisputed classic - a benchmark by which other, similarly themed movies are judged. Director Martin Scorsese, considered by many to be the finest American film craftsman working today, can claim a unique distinction - he has been responsible for a classic during each of the last three decades of the 20th century. In the '70s, it was Taxi Driver. In the '80s, it was Raging Bull. And in the '90s, it was Goodfellas (the most lauded, at least in terms of official awards and nominations, of the director's features). No one else, not even greats like Ingmar Bergman, Stanley Kubrick, and Eric Rohmer, can make a similar claim. With patience, care, and strict attention to detail, Scorsese has staked out an impregnable position in the history of motion pictures. It is not a coincidence that Scorsese's three masterpieces all star Robert De Niro. These two men, who have worked together eight times, bring out the best in each other. Even their "lesser" collaborations, such as Casino and The King of Comedy, possess an energy and intensity that shows how well they understand one another. Scorsese is at his best when directing De Niro, and De Niro is at his best when being directed by Scorsese. The pair has become inextricably linked in the public consciousness because of Taxi Driver, Raging Bull, and Goodfellas. There are essentially two kinds of Mafia movies: those that romanticize the life and those that depict it with gut-wrenching clarity. The best known and most accomplished of these films, The Godfather, stakes out its territory firmly in the first area, leaving Goodfellas to stand atop the other. Both pictures have fully realized, three dimensional characters and strong atmospheres, but Francis Ford Coppola's effort embraces the mythos of the gangster, while Scorsese's exploration is more pragmatic. Violence is a key component of each, but it is a more brutal companion in Goodfellas than in The Godfather. Clearly, the different approaches adopted by the directors result in films that, while populating the same genre, are dissimilar in temperament and tone. Goodfellas is, as we learn at the very beginning, based (however loosely) on a true story. Developing the screenplay's skeleton from the events related in the novel Wiseguy by Nicholas Pileggi (who also co-wrote the script), Scorsese has used the facts from an infamous '80s case involving an important mob informant to develop a rich and multi-layered study of three characters and the culture that shaped their lives. It's a fascinating exploration of a lifestyle that has beguiled Americans for most of this century, whether in movies, in novels, or on television. The story opens by introducing us to 13-year old Henry Hill (played by Christopher Serrone as a youngster and by Ray Liotta as an adult), our narrator. It's the '50s in New York City, and becoming a member of the mob looks like one of the coolest employment opportunities around. "As far back as I can remember," Henry recollects, "I wanted to be a gangster." And no wonder - to a kid just entering his second decade of life, these men have everything: friends, girls, cars, cash, and, most importantly, respect. "Being a gangster was better than being the President of the United States." Henry pursues his goal and soon has become a gofer for the brother of Paul Cicero (Paul Sorvino), the neighborhood boss. His first taste of the life is a heady experience. "I was treated like a grown up. I was living a fantasy... At 13, I was making more money than most of the adults in the neighborhood." By 1970, Henry has achieved a position of some importance in the organization. He and his two closest associates, hotheaded Tommy DeVito (Joe Pesci) and no-nonsense Jimmy Conway (De Niro), are becoming involved in areas that aren't approved of by everyone in the mob - in particular, drug dealing. Henry, now married to a nice Jewish girl named Karen (Lorraine Bracco), leads an increasingly more reckless life that results in his taking on multiple mistresses, becoming involved in Tommy's murder of a "made" mobster, and spending a term in jail. Once Henry returns to the outside world, he becomes aware that old alliances are shifting and that his life may be in jeopardy from those he once considered to be his closest friends. There are two principles of the gangster way - never rat on your friends and always keep your mouth shut - and Henry may have to violate both in order to preserve his life. Goodfellas is as compelling and absorbing as any crime drama I have ever seen. The script shows all the facets of these characters; they are all fully developed individuals capable of great good and great evil. The moral ambiguity of their lifestyle is treated with a shrug. 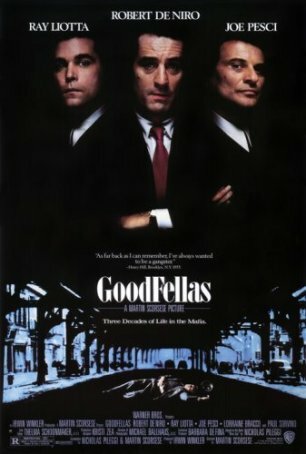 Goodfellas is not about Mafia dons, but about those who exist on a lower level. It's about the bonds that are formed between compatriots in crime, and how betrayal is the most heinous offense imaginable. The mob is a fraternity - an all-boys club where everyone looks after each other. The story, which spans a quarter of a century, has an epic feel despite its intimate perspective. The first forty minutes, which detail Henry's childhood and his acceptance into mob life, is presented almost as a fairy tale, using the same kind of romanticized approach embraced by The Godfather. The purpose of this segment is to forge a bond between the audience and the main character while he is still relatively innocent. Henry does not grow up to be a nice man, but, because of the way Scorsese has structured the early portions of the film, we remain sympathetic to him throughout. Over the years, few directors have exhibited Scorsese's ability when it comes to using pop music to set a scene or cement the atmosphere. On many occasions, the appropriation of period songs seems like a transparent attempt to sell the movie's soundtrack album. But, in Goodfellas, Scorsese's selection of "Then He Kissed Me", "Ain't That a Kick in the Head", "Gimme Shelter", "Monkey Man", "The Magic Bus", "What Is Life", and dozens of others proves to be invaluable. The songs mesh perfectly with the visuals, successfully taking the place of a strong score. Goodfellas begins calmly, but, by the time the final credits roll, there has been a great deal of blood shed. Some of the violence is sudden, shocking, and visceral. One death in particular comes as a total surprise, and leaves the viewer momentarily stunned and disoriented. Even after I have seen the film numerous times, this scene remains unsettling. There are many other moments that have a similar, albeit less amplified, impact. Goodfellas does not rely on plot twists to hold the viewer's attention - the strength and breadth of the story and characters do that - but one of the film's strongest traits is the sense of uncertainty that hangs over every frame. Scorsese's tactic of using two narrators (sometimes Henry's voiceovers are replaced by Karen's) even leaves open the possibility that Henry might not survive the film. As is often true of the director's work, Goodfellas is a masterpiece of visual composition. Employing the services of German-born cinematographer Michael Ballhaus (who also collaborated with Scorsese on After Hours, The Last Temptation of Christ, and The Age of Innocence), Scorsese eschews a static camera, always keeping the canvas of his film fluid. There are long pans and innovative flourishes, all designed to enhance the mood and involve the viewer in the action. On one occasion, the camera sweeps around a bar then into a back room, pausing on faces as Henry's voiceover introduces each of the wise guys. Later, we are presented with the famous, disorienting shot of Henry and Jimmy facing each other across a table at a diner. They appear to remain in the same position relative to us while the background slowly recedes (this effect was accomplished by moving the camera away from the actors while simultaneously using the lens to zoom in on them). For character-based dramas such as Goodfellas to rise above the level of a well-crafted melodrama, strong acting is a necessity, and this movie contains several unforgettable lead performances plus solid support by those in lesser roles. The most flamboyant portrayal is turned in by Joe Pesci as the often out-of-control Tommy. Pesci won an Academy Award for his work here, crafting a character that can be charming at times and unexpectedly violent at others. (Pesci virtually replicated this part for Scorsese's Casino.) The brilliance in the performance is how easily and rapidly Tommy shifts from one mode to the other. A single minor thing - an action, a word, etc. - can set him off. Pesci makes the sudden transition seem credible rather than jarring. While their parts aren't nearly as scene-stealing as Pesci's, Liotta and De Niro form the bedrock upon which Goodfellas is constructed. De Niro, who has become associated with this kind of role over the course of a long and successful career (owing in no small part to his portrayal of the young Vito Corleone in The Godfather Part II), slides easily into the role of the charismatic, yet potentially violent, Jimmy. Like almost every memorable wise guy on screen over the years, he is both suave and dangerous. Watching De Niro's perfect interpretation of Jimmy brings to mind his version of Al Capone in Brian De Palma's The Untouchables. Both characters share a host of traits, both in terms of temperament and personality (although Jimmy is considerably lower on the mob food chain). Liotta has the arguably thankless job of playing the most normal of the gangsters. It's not a splashy part, but he is convincing enough to provide an easily accessible entry point into the story for the viewer. In a real sense, Liotta's Henry becomes our guide through the murky world of crime, friendship, and betrayal. Without Liotta's unflagging performance, we might become lost. Also worth singling out for notice is Lorraine Bracco, who received Best Supporting Actress nominations from both the Academy and the Golden Globes. This is without a doubt the most impressive work the actress has accomplished during the course of an uneven career. She brings both strength and vulnerability to Karen, and makes the most of a limited amount of screen time. Paul Sorvino fits snugly into the role of Paul Cicero. Like De Niro, Sorvino often finds himself playing gangster types. In other supporting performances, Catherine Scorsese (Martin's late mother, playing Tommy's mom) and Frank Vincent (as Billy Batts, the object of Tommy's bloody ire) are striking in the few minutes accorded to them. Film critics will argue over which represents Scorsese at his best - Taxi Driver, Raging Bull, or Goodfellas. Each movie has its fierce advocates, but to single out one at the expense of the other two seems to be a pointless and counterproductive enterprise. Taxi Driver and Raging Bull are more focused on an individual than Goodfellas, which examines how a culture shapes values, life choices, and relationships. Taken together, these three offer insight into the themes and ideas that are closest to Scorsese's heart. Taken individually, each represents an amazing motion picture accomplishment, with Goodfellas standing alongside The Godfather as one of the two greatest mob stories told on film.